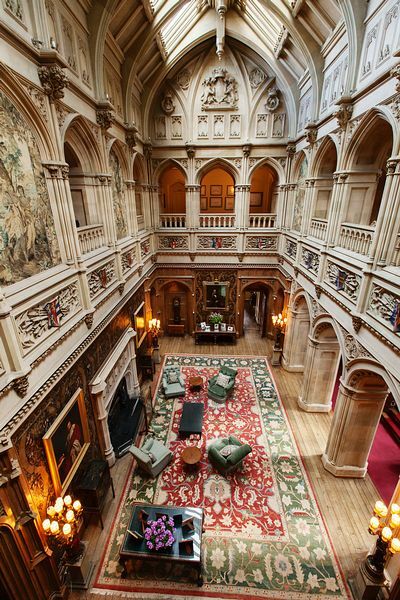 Highclere Castle is the magnificent family home of the Earl and Countess of Carnarvon. It is located in Hampshire only a few miles south of Newbury. 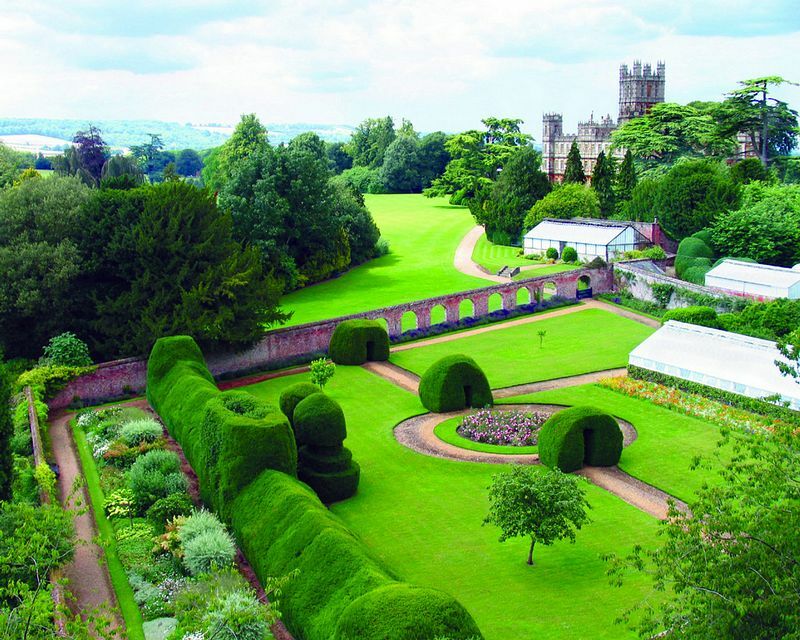 Today the Castle is well known as the location for the filming of the popular historical TV drama "Downton Abbey". The Entrance Hall was designed by George Gilbert Scott, with slim columns of red and blue marble which ascend up to a domed roof. 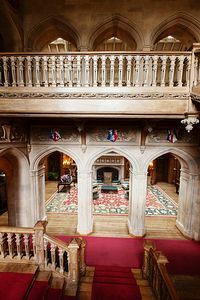 As befits such an imposing house Highclere Castle has not one but two main Staircases, both are used by the family and guests. carving and installation of the staircase took Messers Cox and Son of London almost a year to complete. The Red Staircase rises up to the second floor and the previous nursery apartments. The Saloon was planned in gothic style, by Thomas Allom for the 4th Earl, in the 1860s. The extraordinary leather wall coverings date from 1631, they were brought to Highclere Castle from Cordoba in Spain by the 3rd Earl and were hung in the Saloon in 1862. Matching panels can be seen in the Rijksmuseum in Amsterdam. Any one dining in this magnificent room, could not fail to feel dominated by the equestrian portrait of Charles I by Van Dyck. It is flanked on either side by portraits of the Carnarvon family who were involved in the English Civil War in the 1640s. The double library, running almost the length of the house contains over 5,650 books, the earliest dating from the 16th century. 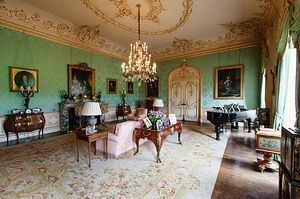 The 4th Earl of Carnarvon enjoyed it as a "withdrawing room", where as an active member of Disraeli's Cabinet he could meet with like-minded friends, or simply have a little quiet time to himself. Today it is used by the family, where they gather to meet up, before and after lunch or dinner. This wonderfully elaborate room faces south and has views to two of the Castle's follies, at the top of Siddown Hill is Heaven's Gate and in the east is Jackdaw's Castle. The walls are hung with exquisite Italian embroideries from the 16th century. Here you can see the surprisingly simple desk, which was owned by Napoleon. From the music rooms are further pretty, gilded light rooms such as the Morning Room which were specially made for the fifth Countess. Room was a gift to Lady Almina the 5th Countess, by her father Alfred de Rothschild in 1895. Between the double doors from the drawing room leading to the smoking room are cupboards which were used to hide and keep safe the collection of the 5th Earl's compilation of Egyptian archaeological finds. This room is home to Dutch paintings from the 17th century, brought back to Highclere Castle by members of the Carnarvon family. 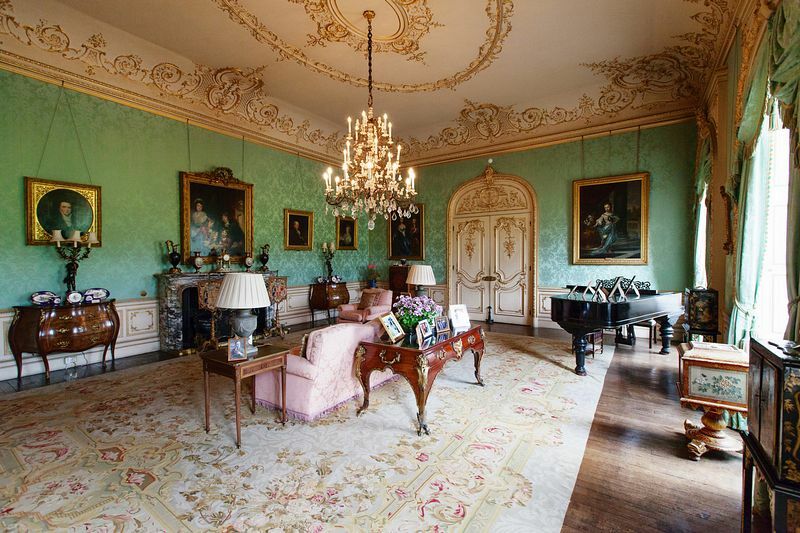 Also shown is art from the early 19th century and portraits of family cousins at Wilton House. On the first floor are 11 bedrooms, some of these are open to today's visitors. The current countess has carefully renovated them over the last few years, consulting the castle's archives of drawings and prints as well as recording the visitors and their historical interest who used the rooms. On the higher floors are 40 - 50 further rooms, which are now unused and are not on view to visitors. The luxurious Stanhope bedroom was decorated in rich red for a visit of the Prince of Wales in December 1895. Next door the dressing room has recently been redecorated. The Arundel bedroom and dressing room were used as an Operating Theatre and Recovery Room during the First World War. At this time the 5th Countess, Lady Almina transformed Highclere into a military hospital, taking an active part, by herself heading the nursing staff. The Mercia bedroom contains a delightful four-poster bed, adorned with 18th century silks and complimentary furniture. Behind the green baize door leading from the Saloon, is the stone staircase, very well used and known to the servants of all ranks, who worked above and below stairs for the Carnarvon family. The staircase was planned to take the servants up three floors to attend to the family and carry out their cleaning and domestic duties unobtrusively. It also enabled them to access their own domestic quarters downstairs. In earlier years the housekeeper's sitting room, the butler's pantry together with the staff dining room were all in the basement. Today this area is given over to the visitor's tea room and to the Egyptian Exhibition. This exhibition celebrates the 5th Earl of Carnarvon's achievements. He first travelled to Egypt in 1898 and from 1906 spent several winters there. During these times he obtained permissions to excavate over a period of 16 years near Luxor in the Valley of the Queens, the Valley of the Nobles, the Valley of the Kings and in the Nile Delta near Alexandria. Many discoveries and purchases were made during this time and Lord Carnarvon formed a unique collection of Egyptian artefacts. Together with his archaeological colleague Howard Carter they discovered the Tomb of Tutankhamun in 1922. Following the Earl's death in 1923 his widow sold the majority of the collection to the Metropolitan Museum in New York to pay death duties. It was catalogued by Howard Carter, who stated that he had left a few unimportant items at Highclere. They were stored in hidden cupboards for safekeeping and were found by the family in 1987. The exhibition shows visitors many wonderful things, including 60 incredible replicas of Tutankhamun's tomb, including wall paintings and photographic archive. 1,000 acres of sweeping parkland surround Highclere Castle, designed by Capability Brown for the 1st Earl of Carnarvon. Today the gardens and parkland are a haven of peace and tranquillity with wonderful views over the down lands of north Hampshire and the Kennet Valley. old. They were grown from seedlings which were given to the 1st Earl of Carnarvon by his cousin the Earl of Pembroke at Wilton House. Jackdaws Castle is on the east lawns, it is a pillared temple built by Robert Herbert in 1743 and affords a delightful view to and from the Castle. The Temple of Diana and Heaven's Gate is an Etruscan temple situated to the south west of the Castle, at the edge of woodland walks. It can be seen from the summer walks off the Wayfarers' walk also from London Lodge. Downton Abbey is a British period drama television series, written by Julian Fellowes. It was first seen in Britain in September 2010. As a friend of the Carnarvon family Julian Fellowes knew Highclere Castle well and thought it was the perfect setting for Downton Abbey. 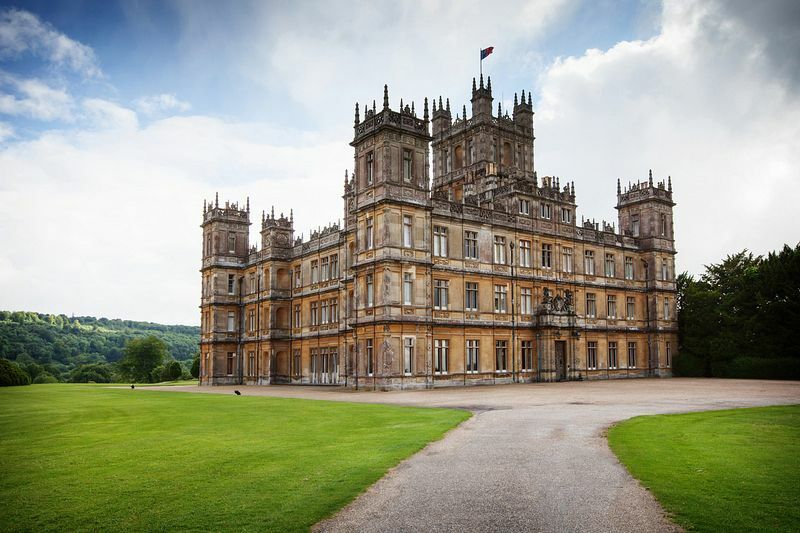 With the gracious permission of the 8th Earl and Countess, Highclere Castle and its surroundings became the setting for this phenomenally successful series. It has been viewed and appreciated by audiences of over 11 million viewers in Britain alone and has been shown in over 100 countries around the world. The programme's success has been recognised with many well-deserved awards. It is no wonder then, that Julian Fellowes is now Lord Fellowes. Downton Abbey tells the story of the Crawley family, Earl of Grantham, Robert Crawley, his wife Cora the Countess, and their daughters Mary, Edith and Sybil and their servants, during the reign of King George V.
This covered two years prior to the First World War and the news of the disaster of Titanic's sinking in 1912.
catastrophies had on the Crawley family and their servants. The third series was shown in September 2012. Downton's financial difficulties continued, but would a visit from Lady Cora's American mother help the situation? Series four, first screened in the UK in 2013 shows the family coping with the aftermath of tragedy. On a brighter note, there's also the arrival of a new generation. Set against the backdrop of the Roaring Twenties, there are extravagant house parties, dinner parties, an exciting trip to London for Rose, and all the fun of the fair at Downton. There have also been annual Christmas specials from 2011 onwards. These shows included most of the regular cast of characters, but also introduced some visiting guests to the cast. They have consistently been some of the highest rated shows on British TV over the Christmas period. Although many of the rooms mentioned above have been featured in Downton Abbey, the kitchens and staff dining room, also some bedrooms were recreated and used for filming at Ealing Studios in London. Bampton, a village in Oxfordshire, was used for outdoor scenes, as well as St Mary's Church and the library in the village which was used as the entrance to the cottage hospital. The scenes of First World War trench warfare in France were in fact filmed in Suffolk, close to the village of Akenham. Other historic houses and locations were also used in the making of Downton Abbey. 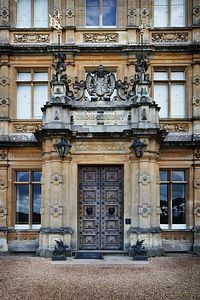 Waddesdon Manor in Buckinghamshire was used as the fictional "Haxby Park", the estate Sir Richard Carlisle planned to buy in series 2. Inveraray Castle was used for "Duneagle Castle" in the 2012 Christmas special. Greys Court in Oxfordshire, was where the family might have moved to when they were in financial problems in series 3. An Anglo Saxon charter exists which indicates that the area around Highclere has been inhabited for around 1300 years. The Bishops of Winchester owned this estate from the 8th century and was recorded in the Domesday Book. The original Elizabethan "Highclere Place House" underwent extensive rebuilding works in the late 18th and early 19th century, when it was renovated into a Georgian Mansion. This in turn was transformed in 1838, for the 3rd Earl of Carnarvon by Sir Charles Barry into the magnificent Highclere Castle we see today. Sir Charles Barry was also responsible for the Houses of Parliament - and you can certainly see similarities in the design. The work inside the Castle was complete by 1878. It was a grand mansion, which did not fail to impress all who saw it. The Castle soon became a popular gathering place of political and cultural life. 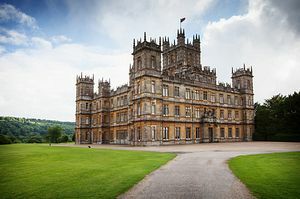 Highclere Castle was seen to exemplify the self-assurance and allure during the Edwardian era, in the early years of the new century. The Castle contains visitor books from the period recording house parties of politicians, aviators, Egyptologists, politicians, technological innovators, and soldiers. The Castle was prepared for the First World; when it was turned into a hospital by Almina 5th Countess of Carnarvon. In September 1914 patients arrived from Flanders to be cared for in the Castle. Lady Almina soon became an accomplished healer. The Castle archives hold 100's of letters received from patients, families and friends, which bear evidence to her tireless work, strength of mind and kindness. In 1922 Highclere Castle reverted to a private home for the Carnarvon family. Briefly the Castle was a home for children evacuated from North London, during the 2nd World War. The present Earl and Countess of Carnarvon continue to be closely involved in the daily life and future of Highclere Castle. Pre-booked tickets for are now available only from the Highclere Castle Website (Link below). Sunday 13th July – 28thJuly. (Closed Fridays and Saturdays). CLOSED 29TH JULY – 5TH AUGUST (for special Heroes at Highclere event). Wednesday 6th August – Wednesday 17th September. Closed Fridays and Saturdays during summer opening. *Children under the age of 4 receive complimentary entry and do not need a ticket. We highly recommend pre-booking your tickets to visit Highclere Castle as this is the only way to guarantee your entry on a specific date. Take A34 south; direction Winchester. After approximately 8 miles exit A34 at Tot Hill services and follow brown tourist signs. Proceed on A303 towards Andover. Take A34 north to Whitchurch & Newbury. On approach to Beacon Hill signposted Burghclere; Whitway follow Brown tourist signs to Highclere Castle.